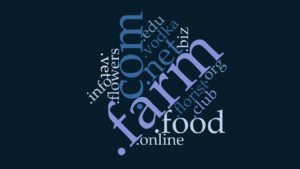 Should You Add New Domains to Your Farm’s Web Address? Check out RicksFarm.Farm. Actually, don’t! It’s a dead end, but someone does own that domain. It just doesn’t go to a website. My apologies to the real RicksFarm.com, though, if you accidentally typed that in. Old habits are hard to break. That one is not mine either, but I couldn’t avoid the temptation to check out the availability of a couple renditions after my internet domain registrar told me I could now add a dot-farm extension to some of the farm business domains that I was renewing. Oh, you didn’t know about .farm either? Just so we’re on the same page, as explained in Web terms 101: The difference between a URL, domain, website, and more, a domain name is what you type after the “@” in an email address or after “www” to go to a website. This is the Top Level Domain (TLD), and you buy them through registrar companies like domains.google, GoDaddy, or name.com. A Universal Resource Locator, or url, is the complete address to an individual web page that gets created as you build a website. A url includes the TLD followed by more coding after a backslash (/). Often, the home page url is just the TLD, and now most sites don’t even require the “www” anymore. If you’re like me, we’ve been ingrained since the beginning of the world wide web — way back in the 1990s — that unless you’re in government (.gov), education (.edu), or a non-profit group (.org), your web address should simply reflect the name of your business and end with a dot-com. As a matter of fact, you’re probably hearing a little jingle every time you read dot-com. Some of the discussions floating around the web might make you think there is another dot-com bubble burst coming. This time it might take a bit longer for dot-com to lose its prominence in the domain naming arena. That probably won’t be as deleterious as the financial meltdown around Y2K either. On the other hand, if Internet Corporation for Assigned Names and Numbers (ICANN), i.e. the international governing body that sets the rules for domain names, continues its rollout of over 1,300 new domain extensions that it started around 2014, why would anyone settle for a plain old, boring web address anymore? As I pressed the renew buttons for the .com, .org, .info, and .net versions of my current domains, I pondered what would be the advantage of owning ricksfarm.farm (other than my registrar collecting another domain registration fee). Writing at blog.searchmetrics.com in 2015 (shortly after the ICANN domain extension expansion began), Jordan Koene agreed that “our minds are wired to think ‘dot com,’” and that dot-com is a boost for Search Engine Optimization (SEO). Because of the 100,000 domains and 100 million links they analyzed for a Ranking Factors Study, “75% of all links go back to .com domains,” he claimed there’s no need to have alternative extensions. However, the counterpoints in the comments to that post were quite revealing. One reader pointed out that the new naming features would kill King.com in the not too distant future because entire TLDs can be used to reinforce a brand, and the small business sector, which is often blocked from getting memorable .com domains, will embrace these new opportunities. Likewise, another reader added that more creative domain names could easily be promoted via “print and other non-web advertising” with examples of longer extensions that had done well, especially with more aggressive off-web marketing. So how creative could I be? I can still buy ricksfarm.farm, along with .net, .org, .info, .biz, .online and .club. I could add .garden, .florist, .flowers, and .food, or .vet, and .vodka (but not .veg or .fruit, and there’s no three-letter limit anymore). Dot-market and .store are great for direct marketers. Though .ag seems like a perfect fit, it is the country code for Antigua and also has connotations for businesses in German-speaking countries, but some agriculture businesses have adopted it. 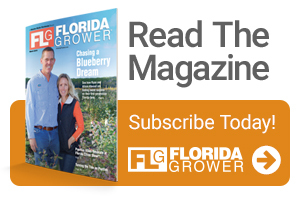 Of course, in the interest of finding a good alternative, and hopefully selling me a couple more domain names, if I insisted on using .com, my registrar also suggested some slight variations – like ricks-farm.com or ricksfarmfresh.com. However, the real advantage these new extensions will give farmer marketers is that .farm and some others will help in sticking to the K.I.S.S.M. principle – Keep It Short, Simple and Memorable! Richard VanVranken specializes in small farms, farm marketing, and helping growers find a market for non-traditional crops. 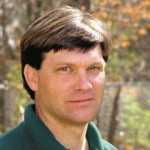 He is also Professor and County Extension Department Head of Rutgers Cooperative Extension of Atlantic County in New Jersey.